The Notre Dame Fighting Irish’s basketball season came to a close this past weekend, losing 73-63 to Penn State in the second round of the National Invitational Tournament. The loss brought a difficult season in South Bend to a close with a 21-15 record. That record should solidify Mike Brey as one of the premier coaches, not only in the ACC, but in the NCAA as a whole. Prior to the start of the 2017-18 campaign the Irish had both ACC and NCAA title aspirations based on the return of 2016-17 All-ACC first team member Bonzie Colson along with potential All Conference point guard Matt Farrell, breakout candidate Temple Gibbs and five star freshman DJ Harvey. The season started off well enough, through the first eight games in the out of conference the Irish stood at 7-1, including a victory over Wichita State to win the Maui Invitational and the only loss being to high powered Michigan State in the ACC/Big 10 challenge. Issues started to arise just before conference play with losses to both Ball State (in South Bend) and Indiana (neutral court) but for the most part a 10-3 record heading into ACC play was nothing overly concerning. 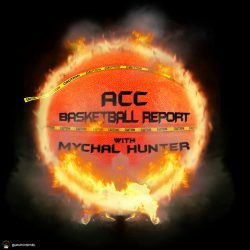 However, after a win over Georgia Tech to open the ACC slate it came to light that Colson had broken a foot in practice and would be out for at least six weeks. In the very next game point guard Matt Farrell played 15 minutes before being lost to a sprained ankle that would cost him five games during the ACC season. Freshman DJ Harvey, a highly regarded recruit from the 2017 class was expected to step up in the absence of Colson when he too was lost to injury, suffering a bone bruise in his knee that would cost him 17 games. Somehow, through all of those injuries Mike Brey was able to guide the Fighting Irish to an 8-10 record in the ACC and another 20 plus win season. The emergence of Temple Gibbs was somewhat expected but his level of play far more than even I anticipated. The way Martinas Geben (11 and 8 per game) stepped up in the absence of Colson was something few probably thought possible. This team lived up to its handle and fought the entire season to give itself a legitimate shot at the NCAA Tournament but was ultimately knocked out by a bid stealing Davidson team in the Atlantic 10 tournament. In my eyes they are one of the great success stories of college basketball this season and Mike Brey and his players should be praised for the level of competitiveness and hunger that they played with. Previous PostPrevious Down goes Frazier!! !